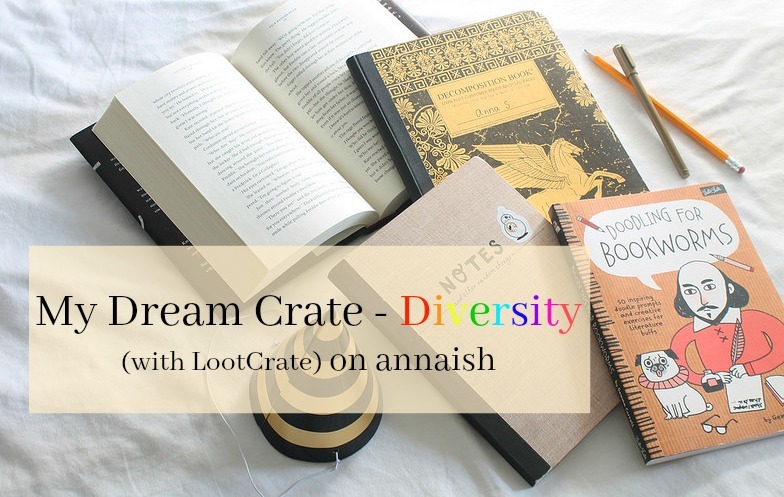 When I learned about "Dream Crate" project, being run by Loot Crate, my first thought was: a Maggie Stiefvater Crate. I'm weak, I know. But I mean, no one has ever done a Maggie Stiefvater subscription box! (at least that I know) But I did wanted to step out of my comfort zone for this project. So I decided to make my dream crate filled with things that connect with diversity, a topic I'm learning about. Confession: I haven't read this book. But the positive hype around Not Your Sidekick is wonderful! I didn't just pick this book for it's hype. I want Not Your Sidekick in my crate (you can also read that picture header above for more reasons) because a) it's so diverse and rich with color b) it's not cliche - it deals with common life problems c) it's a book dealing with superheroes and super villains - how could you say no to that! I'm sold with this book. To be honest, this is plan B. I would prefer Not Your Sidekick merchandise (bookmark, book plate etc etc) from the publisher before I dive into personal shops. But, again, this is plan B. Any who, I absolutely love SkinnyHues and LexyOlivia's bookmarks! Their watercolor products are really beautiful. I would include one of these specific bookmarks or ask to get a bookmark personalized for Not Your Sidekick. When I first saw this art print, I was blown away. It's really just screaming "Together!" I love how simple but how powerful this print is (and the art style). It would be an honor to have this art print in my crate. click the picture (or here) to read the synopsis. to the view the travel mug, click here. So let's move on to graphic novels/comics, one of the largest growing LGBT medias. LumberJanes is one of my favorite graphic novels ever. I had to include it in my Dream Crate. It's also very diverse, LumberJanes features a transgender girl and two lesbians. This graphic novel will become one of your favorites instantly with it's loveable LGBT characters and hilarious dialogue! Along with the graphic novel, I would also include this LumberJanes travel mug. It features all the main LumberJanes girls - reading. Isn't it so cool?! I simply adore it. A BATH BOMB - "EARTH BOMB"
A bath bomb is a necessary item in my Dream Crate (they are truly da bomb ( ͡° ͜ʖ ͡°)) so I'm going along with this Earth Bomb. It's a "sea breeze-scented bath fizzer with a surprise inside! ", says the site. This must smell amazing, am I right? A DRAWSTRING BAG WITH THE SAYING - "I'LL GET THE ALIEN, YOU GET THE GIRL"
Supergirl fans - this one is for you! I, personally, don't watch Supergirl yet(!) because I'm trying to get through The Flash first. Then I must finish Merlin or my friend may just come to my house, force me to sit down and watch Merlin. Yeah - she's obsessed. Anywho! Supergirl! Did you know that Supergirl is the first female-led superhero show since the 1970s? I was shocked. And it just introduced a lesbian character - Alex Danvers, Supergirl's sister. There is also a POC police officer. This show is going places! So I incorporated this TV show with its own quote. The quote looks so good on a drawstring bag. The goal was to include one sticker in my Dream Crate but I surpassed that with adding three stickers. Haha but I fell in love with all these beautiful stickers! I also decided to go with the medium size. Well, there you have it - my Dream Crate! I hope you enjoyed discovering more diverse books, shows, and shops. I plan on talking about and sharing more diverse titles here on annaish. And big thanks goes to LootCrate for reaching out to me to do this project. Happy Wednesday bookaholics! Did any of these books or shops catch your eyes? If you have any diverse shows or graphic novels etc etc I should read or check out, please link them down below. I really want to learn/discover/surround myself with more diverse titles. This is really interesting! It's cool that you get to do this!